I founded a company while at Northwestern, and it failed after a year and a half. My co-founders and I dedicated a significant amount of our time over a year and a half working on a startup called Backlight. We had big dreams – we were going to use artificial intelligence to streamline resume (and hopefully, other text) optimization and make it accessible and affordable to anyone looking for a job. The career services industry had been stagnant for years: you need a one-on-one with an HR expert which will cost you $200 or more, otherwise you’re out of luck. It seemed like the perfect combination of a human touch with our great customer service and cutting-edge technology with our complex algorithm. Unfortunately, it wasn’t that simple and we shut down Backlight’s operations in April 2018. Luckily for me, at The Garage failure is not only emphasized, but encouraged – for the right reasons. It is, after all, one of the best ways to learn. I failed on multiple occasions not only with Backlight, where I failed to properly manage my team and failed to do the right market research before diving in to this endeavor, but I also failed multiple times before founding Backlight. But enough with the sob story, and on to some of the good stuff. Getting accepted as a Resident of The Garage was actually one of my biggest successes at Northwestern. My time working with the students, staff, mentors – basically everyone – at The Garage was overwhelmingly positive and one of the most meaningful experiences I’ve had in the last four years. First off, I’d like to start with our mentors. Through The Garage, I’ve met dozens of fascinating people who are professionals, entrepreneurs, and students alike. The professionals who took the time out of their days to sit on our board of advisors and our mentors were all incredible people who taught our entire team a lot about life, what it means to be an entrepreneur, and how to find our own definitions of success. I’d like to specifically recognize the man who ran the fellowship program we were a part of, Billy Banks. Not only did he keep us accountable and help us grow as people and entrepreneurs, but he made a real, personal connection with every single student he interacted with. It is few and far between that you’ll find someone as honest, compassionate, and full of sage wisdom as Billy and this seems like a good time to thank him. Building off that, the network of mentors, students, and people I’ve developed through The Garage is worth its weight in gold. I’ve met professionals who are successful entrepreneurs, lawyers, in the finance industry, and everything in between. Most of them have had a genuine interest in building relationships and offering their personal networks and advice for everyone at The Garage. The weekly Family Dinners give Garage Residents the opportunity to poke the brains of people in a wide variety of industries with a wide variety of insights. Not only that, but working with the rest of the Backlight team taught me an incredible amount about handling interpersonal relationships, managing a team, business strategy, and also a lot about myself. I’ve made close friends, built my network, and gained priceless experience along the way. Even though my venture didn’t pan out as I wanted it to, I am a better person, leader, and teammate today due to my experience with Backlight in The Garage. So with all that taken into account, if I had to go back do my Northwestern experience over again, I’d go back, start Backlight and work with The Garage every single time because failing might not be so bad after all. Daniel was a Resident of The Garage, and is a graduate of the Weinberg College of Arts and Sciences at Northwestern. 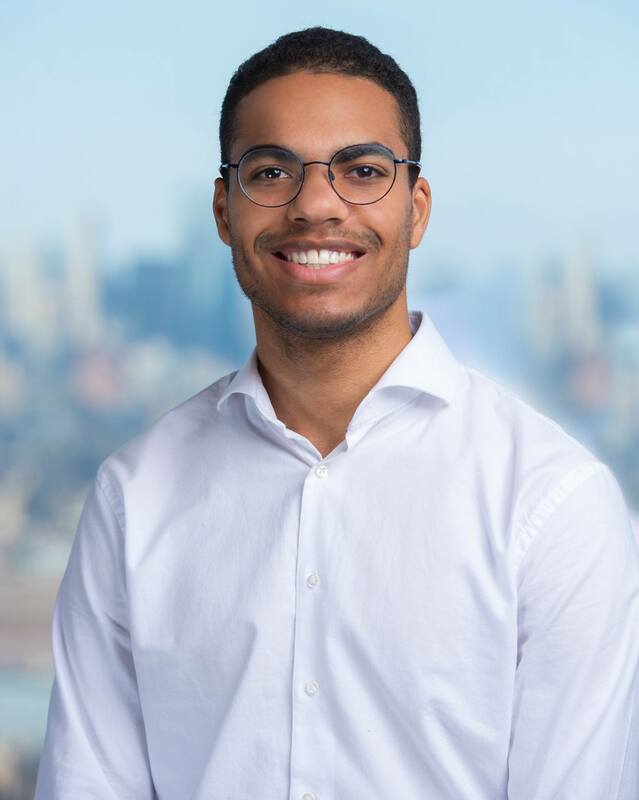 After graduating in 2018, Daniel took a job as an Analyst at Tyree & D’Angelo Partners in the Chicago area. It’s not an exaggeration to say that agriculture is in Shayna’s blood. With a grandfather who immigrated from Germany as a farmer, Shayna grew up hearing about stories on the farm and talking about what real food means. 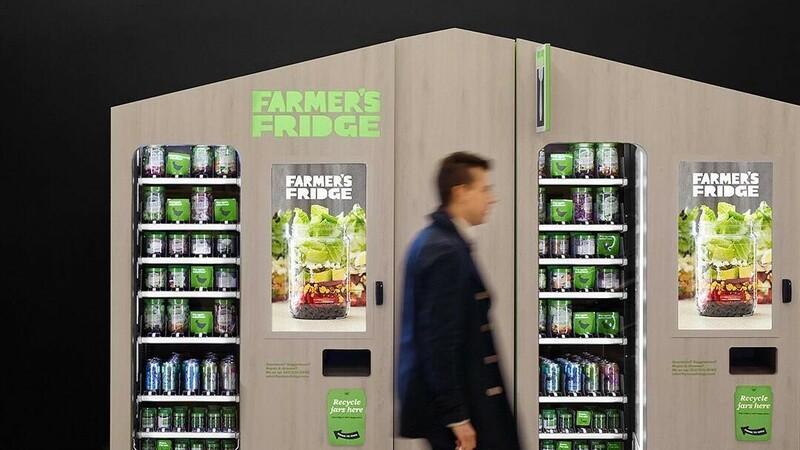 In college, she discovered her passion for sustainable food development, which led her to become the current Chief Growth Officer at Farmer’s Fridge, a Chicago-based start-up that sells fresh, nutritious foods through vending machines. Shayna has always thrived in non-structured environments where roles are undersigned. She loves figuring out the big question — How do we get there? Shayna loves thinking big, creating, and being dynamic. In this interview with Activate, Shayna talks about the importance of staying genuine and doing what you love; the challenges of working in the food industry; the meaning behind her personal slogan “made by humans”; and more. 1. Tell me about yourself and how you arrived at where you are. I grew up hearing stories from my grandfather about farming, food, and land. This sparked an early passion for me. In college, I learned that 75% of world’s poor people live in farming regions. I found it so ironic that the people who grow our food and tend our land end up not having any food to eat themselves. I thought this was something I might be able to change. I studied political science and international relations as an undergrad, and was able to study how government policies affect the agricultural sector. In junior year, I travelled abroad to Southern Mexico and wrote my undergrad thesis on the connection between trade, migration, and economics. My study evolved around whether fair trade was really sustaining the local coffee farmers in Mexico. Later on, I had an internship at Oxfam working on sustainable development. I got to work with world’s largest coffee companies to help them understand why it was important to adopt fair trade policies and how to work with farmers. I worked with companies including Starbucks, Green Mountain, Intelligentsia, and Cooperative Coffees. I also got a scholarship to Brazil where I got to understand farmers at a more local and intimate level. That trip was tremendously powerful for me. 2. Why was the Brazil trip transformative for you? That was a transformative year for me because I understood how important it is for humans to have the ability to choose. A lot of farmers that I worked with actually decided to stay on their farms after they received direct access to markets and could go on to do something else. Instead of choosing to migrate to larger cities, they decided to stay on their farms so that they did not have to break their families apart. This hit home for me because my grandfather had no choice but to leave his job as a farmer to provide for the family. That was when I decided to dedicate my entire life to agricultural and sustainable development. 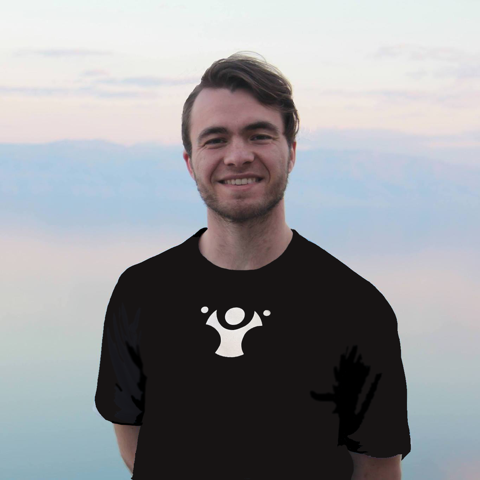 I also decided that I wanted a life of serving others. 3. People usually associate “serving others” with non-profits, not business. What does serving mean for you working at Farmer’s Fridge? What a wonderful question. When I was younger, I also assumed that serving had to be restricted to the non-profit sector, but that is not entirely true. Working at the intersection of government, business, and non-profit allows me to drive the change I want to see. I see service taking place at three different levels at Farmer’s Fridge. First, every decision we make in our business impacts people. At the executive level, we are committed to building a business with fair principles — that means making sure everyone we work with are treated fairly and with humanity. This includes workers, data scientists, kitchen line workers, and basically everyone we work with. Second, Farmer’s Fridge is dedicated to bringing fresh, nutritious meals to people in Chicago, and that is also a way of serving. We are dedicated to zero waste, which means that no unsold meals that are still fresh go uneaten. We partner with the Greater Chicago Food Depository; they help us distribute our foods to places like after school youth programs and homeless shelters. Third, thinking about where our products come from and who we partner with is also part of the service. We partner with businesses that use heritage grain in their brand as well as a small business in Milwaukee that makes nutrient dense wraps. We also work with local apple and peach growers in the Midwest over the summer. We want to make sure that the the raw materials we use are able to impact our local farmers positively. 4. What Farmer’s Fridge is doing is truly inspirational. But there must also be hurdles working in the food industry. Can you tell me about it? Definitely. We are swimming upstream in a food system that does not serve everybody. However, we are very honest with ourselves in acknowledging that we cannot do 100% all the time. There are companies that make such statements, but that kind of marketing prevents us from having honest conversations about the problems with the current food system. What we do believe, however, is that as we grow in scale, we will have more purchasing power and a lot more we can do. 5. It’s not easy to get people to eat healthy. How does Farmer’s Fridge do that? Can you guess how much a meal costs at Farmer’s Fridge? It’s around 5 to 6 dollars, which is not a lot. When our customers think about what to eat for lunch, they usually think about places like Subway, and other businesses that have similar pricing to us. We try to provide the maximum value for our customers by offering something that is both affordable and delicious. We don’t tell people whether to eat healthy or not because that’s a personal choice they have to make. We understand that everyone has different taste, dietary restrictions, desires, and styles of living. What we do know is that there are so many consumers in the U.S. that are not happy with what they are eating. We are just here to provide 24/7 accessible food you can trust. 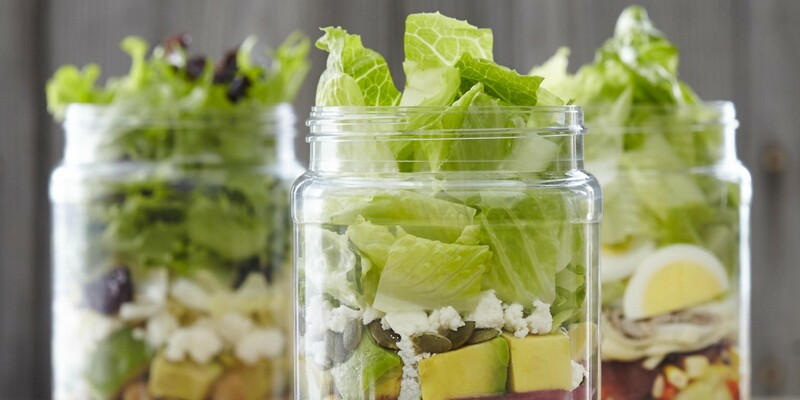 You can see our food in a jar, and it’s transparent. You can pronounce all the ingredients. And then you make the choice of deciding what you want to eat. 6. Is it difficult to keep foods fresh? We have an algorithm that calculates how many products we should have at each location everyday. Our goal is to sell as many products that people need while minimizing the number of unsold products. 7. What would you tell college students that either want to start their own company or join a start-up? For those that want to start a company, make sure you have a true passion for the mission because your role is going to change at the business evolves. You have to really love the idea. For those that want to join a startup, first of all, it’s really fun, because entrepreneurs are really dynamic and wild. It’s important to ask for clarity to make sure you’re on the same page with your boss; manage up; and also believe in the mission. 8. You studied political science as an undergrad. A lot of college students today are concerned that their humanities degree won’t land them a job. What do you have to say to them? I wanted to be a zoologist when I was a kid. I took a lot of English classes in college, simply because I loved it. I have always been drive by an innate curiosity, always driven by passion, and that has served me really well. So many studies suggest that emotional intelligence is highly tied to success, which means that being authentic and doing what you love is really important. When you do what you love, it shines through. People respond to authenticity and genuineness. So my advice would be: do what you love; continue to be passionate; and tap into that authenticity. Pragmatically, I recommend students to do some summer internships. Try to spend as much time as possible to work on different projects and figure out what skills you have to develop. While you are interning, you can also search for ways to apply passion your passion to the marketplace. 2. What’s one piece of advice you would give to your 18-year-old self? Drop the assumptions. Early on, I thought that the only way I could live a way of service was through non-profits. But later on, I realized that the change I really wanted to drive had to happen at the intersection of government, business, and the non-profit world. I grew to have an appreciation for humans that work in all these sectors because they have their own constraints as well as their ways of driving change. So, drop the assumptions and be open minded! Currently, it’s what my four-year old daughter calls “Family time”. Electronics are off/ It’s just a time for me and my family to laugh, enjoy ourselves. Made by humans. This is the slogan of a coffee shop across my office, but it has now become my personal slogan. I appreciate that everything we use and touch in a day is all made by human beings. For me, I live by the principle to respect and be kind to every human being I connect with throughout the day. This piece is written by Alexandra Huang, a Weinberg freshman. Alexandra is the founder of Activate, a publication dedicated to sharing stories of inspirational entrepreneurs. You can read more of Alexandra’s articles on her website. Besides writing, Alexandra is a gourmet and traveler who loves exploring new cultures and experiencing the world. She can be contacted via email. 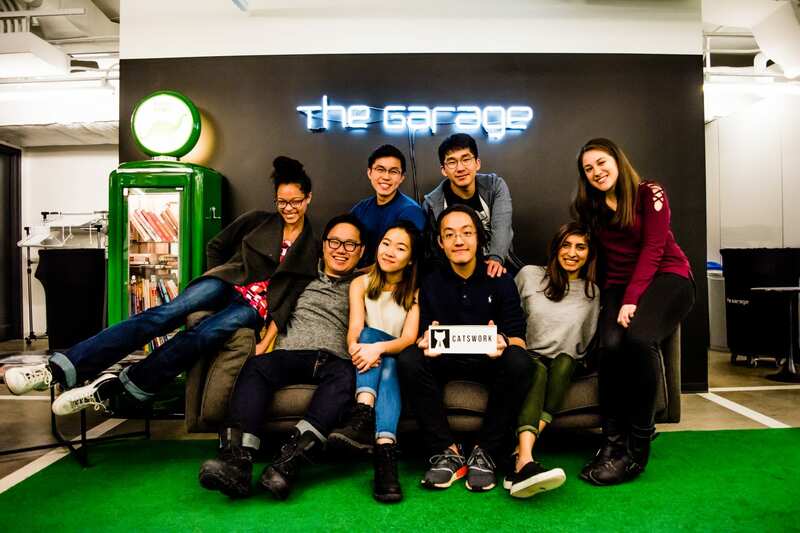 The Garage today announced the selection of five students for a program that supports entrepreneurial innovation at the undergraduate level. The Little Joe Ventures Fellowship, made possible by a gift from Tony Owen ’97, ’03 MBA, and his wife, Monique, provides robust programming, domestic and international trips, and $5,000 stipends, among other things designed to help the students pursue entrepreneurship. The five new LJV Fellows, who have a wide range of backgrounds and interests, were selected by a faculty and staff committee from a pool of more than 20 sophomores nominated by faculty and staff. They form the second cohort of the Fellowship, which was launched a year ago. The Fellowship starts in the spring of sophomore year and ends at graduation. Cohort #2 will soon become immersed in programming developed by Dan Willoughby ’15 MBA, an entrepreneur and former director of Techstars Chicago. Examples of LJV Fellowship activities, held at least monthly, include networking dinners, tickets to events such as TEDx Chicago, and workshops focused on personal and professional growth. 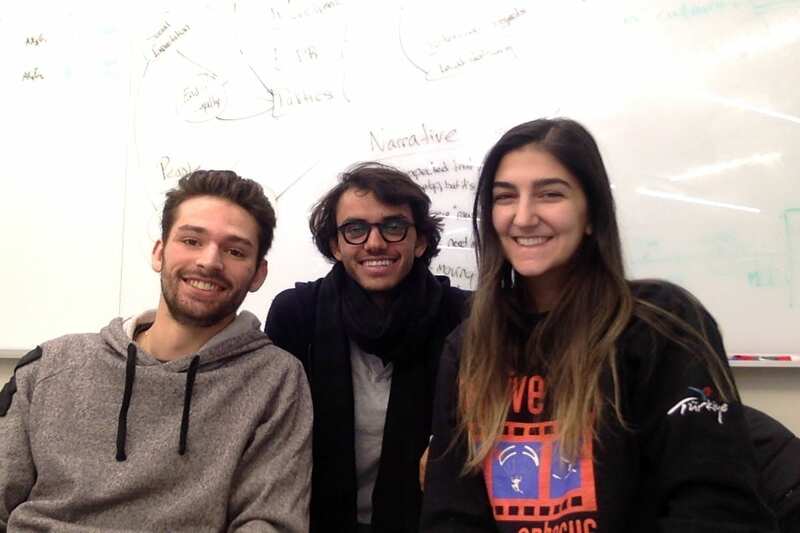 During their junior year, the cohort will travel to Los Angeles for a trip curated by Owen, an investor in emerging food and consumer businesses. The first cohort’s LA trip, earlier this year, included a tour of SpaceX, lunch with Gwyneth Paltrow at her startup, Goop, and roundtable discussions with entrepreneurs from Owen’s network. During their senior year, Fellows will take an international trip. Anthony Kang, project manager of Track Trainer, is lending a hand to help stroke survivors use theirs. Track Trainer is a stroke rehabilitation device that focuses on improving strength and mobility in stroke survivors’ upper limbs. It is in the prototype phase. The Garage sat down with Kang to learn how Track Trainer gets survivors from point A to point B. How does Track Trainer work? It’s a box that looks like an arcade game. There’s a central track and a handle. 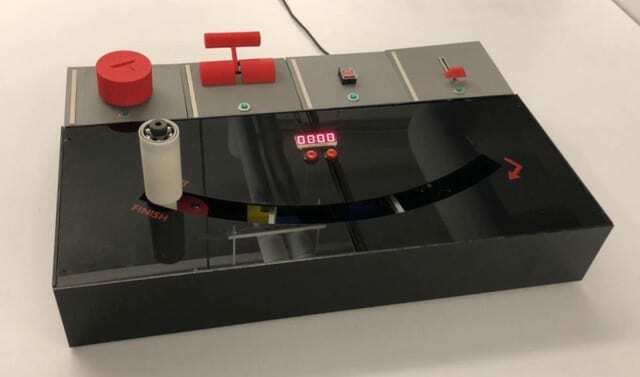 The objective is really simple: You’re trying to push the handle through the track from point A to point B, and then back to point A, but along the track you have multiple gates. At each gate, you have to complete a task, for instance, turning a key or pressing a button. It’s a really simple idea, but it’s actually a big step up compared to what’s currently on the market for affordable stroke rehabilitation devices for the upper limbs. If you’ve been to the doctor’s office and seen toddler toys like ring towers or bead mazes, that’s kind of what stroke survivors have to use right now. We’re trying to make it more engaging and keep it at an affordable price level. How do you address the differences between stroke survivors with different skill levels? With our last prototype we made the task boxes detachable. That was an accident, but it works surprisingly well. We’re making the parts interchangeable so you can switch out the handles for different stroke survivors, switch out the task boxes [and] change the number of task boxes that are plugged in. It’s really giving therapists an opportunity to customize the Track Trainer for different stroke patients’ needs. How have stroke survivors reacted to Track Trainer? There’s so much focus on regaining the ability to walk, so a lot of [the] time, the upper limb rehabilitation gets neglected. That’s why rehabilitation tends to be slower in the upper body. For a lot of stroke survivors, this is the first device they’ve seen that’s actually targeted toward upper limb rehabilitation, but in a more interesting way. Overall, I think the reception’s been really positive. How has The Garage helped? It’s been a great space to meet other people doing really interesting projects. Everyone’s working on something really cool, something that’s really personal to them. It’s been great being part of that community. I think the biggest thing has been the network. Not only our peer residents, but also the entrepreneurs-in-residence [and] the mentors. We’ve had a lot of really great conversations with people here. During our family dinners, a lot of the residents share their failures. I think it’s been reassuring that it’s not always an easy process, but there’s so many people going through that process with us. How have setbacks been helpful? You always learn something from failures. It’s always a really good benchmark for telling you that something’s not working. From that, well, what do we need to do to fix that? We are a three person team. We have myself, project manager, and we have someone on the marketing side and someone on the finance side. But we all do a little bit of the engineering. We have our own roles, but ultimately we’re all building together. And I think that’s really representative of what we like to see. We like to see the stroke survivor community come together to make this a better product. Between the three of us, only one is formally trained as an engineer. We learn the ropes as we go. But I think that makes for some really cool opportunities: trying different things out, going out of our comfort zone to learn engineering techniques, learning different modeling tools, how software and hardware integrate together…It’s been a really interesting experience. Want to learn more? Visit Track Trainer’s website or LinkedIn page. Graduating and landing a first job can be a very exciting time. You may have dreamed of that first paycheck that will help you afford a work wardrobe and furnish an apartment, but it can also be an overwhelming transition. Perhaps you’re moving to a new city or finding a roommate to keep expenses down. Meanwhile, human resources at the new job is sending you the standard paperwork—tax forms, non-disclosure agreements, non-compete agreements and more. You’re so happy to have landed a job, so you click “agree” or “ok” without reading the fine print. When we land our first job, we’re often so pleased to have a salary and benefits that we may not be focused on what may seem like non-negotiable finer points. While you may think to ask about your employer’s insurance and vacation policies, you may skim right over a non-compete clause. But, unbeknownst to you because you didn’t read the fine print, the side hustle that you’ve always dreamed about or even already started could be in jeopardy. It’s your gig, but does your employer have ownership rights to your existing or next big idea? Can you start a business or even a non-profit outside of work? 1. Read any non-compete agreements your employer asks you to sign. Don’t just read it—make sure you understand the terms. What is the time frame and the geographic area that restricts you from competing against your current employer? It is OK to ask questions of the HR rep to understand what you’re signing, and it’s not a bad idea to have an attorney look the document over as well. 2. If you already have a side hustle that you’re planning to continue, be sure the agreement is clear that the employer has no ownership or that you have a waiver. Although rare, be sure there is not a “no-moonlighting” clause that would prevent you from working on another business while employed. 3. There’s a difference between planning and launching. If your side hustle is in the same industry as your current job, you can plan but you can’t launch while you’re still an employee of the company. 4. Keep a log of your hours. If things get sticky with your employer, you’re going to want to be able to show that you worked on your side hustle on nights and weekends, not during work hours when you were working for your employer. 5. Use your own laptop and cell phone. Using your employer’s resources when working on your side hustle creates a risk that the company will have ownership in your new business. 6. Do a great job at work. Your side hustle shouldn’t interfere with your work duties or your employer may believe they were paying you to work on your side hustle and may want a piece of it. You want to build your network as you start your career and not burn bridges. Also, if you quit your job to work on your side hustle and later your venture folds, you’ll want the option to ask your former employer for a reference for a new job. Starting your first job is very exciting, but you’ll want to take the time to read the documents you’re signing. Should you decide to start a side hustle in the future, you won’t have to wonder whether your employer owns the new business you’re creating. Also, protect yourself by not working on your side hustle during business hours, use your resources—not your employer’s, and don’t let it negatively affect your performance at work. Elisa Mitchell is the Assistant Director of Operations and Finance at The Garage and is an attorney and CPA. 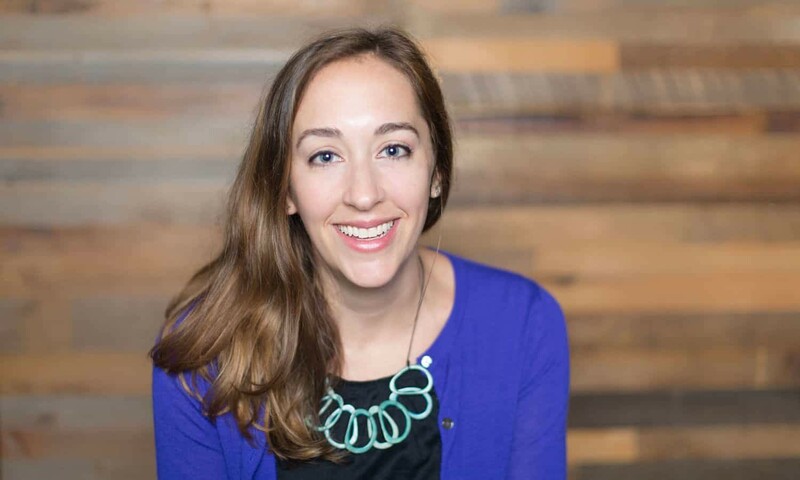 She enjoys helping students start their entrepreneurial journeys and is thrilled to be a part of The Garage. A special thank you to Northwestern professor of law and DPELC Director Esther Barron for her inspiration and review of this article. On Wednesday February 27th – members of The Garage were welcomed into the corporate headquarters of RXBAR. RXBAR is known for its health-conscious and tasty offerings of protein bars. Originally designed to give avid crossfit athletes that extra protein boost after a workout, the company’s co-founder Peter Rahal and his team have taken the country by storm! And has even begun distributing the product lifecycle in the United Kingdom. Upon entering the facility, one might not realize the work that goes on behind closed doors. The glass building in downtown Chicago houses not only the company’s corporate offices, but the official taste and development lab. A rather small lobby welcomes visitors, along with a sign featuring the name of the enterprise, RXBAR. We were led to the third floor and greeted by members of the RXBAR team for what would be a one hour long, round table style discussion. Our visit was led by RX’s Vice President of Design and Organizational Fitness, Jonathan Matta. Over the next hour, Jonathan talked us through the defining moments of the development of RXBAR, as well as the pivotal focus the company maintains in supporting its corporate culture. He highlighted the organization’s mission to drive substantial change within the industry and emphasized the founder’s efforts to protect their culture and identity, even following a multi-million dollar buyout by Kellogg. Jonathan spoke highly of RX’s mission to empower its people to cultivate an entrepreneurial mindset, highlighting that the complex problems they are faced with require creativity to come to substantial solutions. This was piggy-backed with a discussion regarding innovation, more perhaps on the scarify of it. He went on to highlight RX’s mission to change that, saying that good entrepreneurs sell great products, and build great teams. Those at RXBAR believe they are doing just that, and in return, promoting innovation. Based on our taste test… we’d like to agree! Thanks for having us RXBAR! Keep your eye and ears peeled for potential day-treks next quarter! Good luck on finals, Wildcats! At The Garage, students focus on finding solutions to problems. Often, they tackle issues they face in their own lives. It’s not surprising then that so many Residents and Tinkerers jumped at the chance to figure out ways to make Northwestern better. 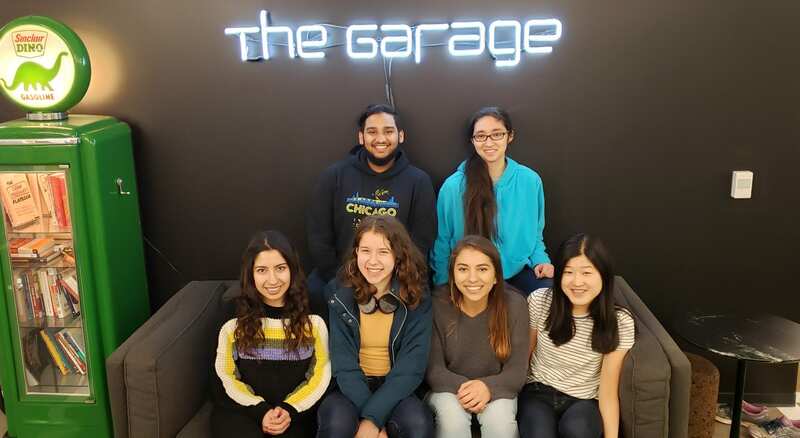 Many of the 20-plus teams that entered ImproveNU — an annual competition in which students compete for funding to pursue projects designed to have a positive impact on Northwestern — started incubating their ideas at The Garage. eo, a student-centered, dockless bike share that aims to increase bike ridership, creating healthy, environmentally-friendly life habits. 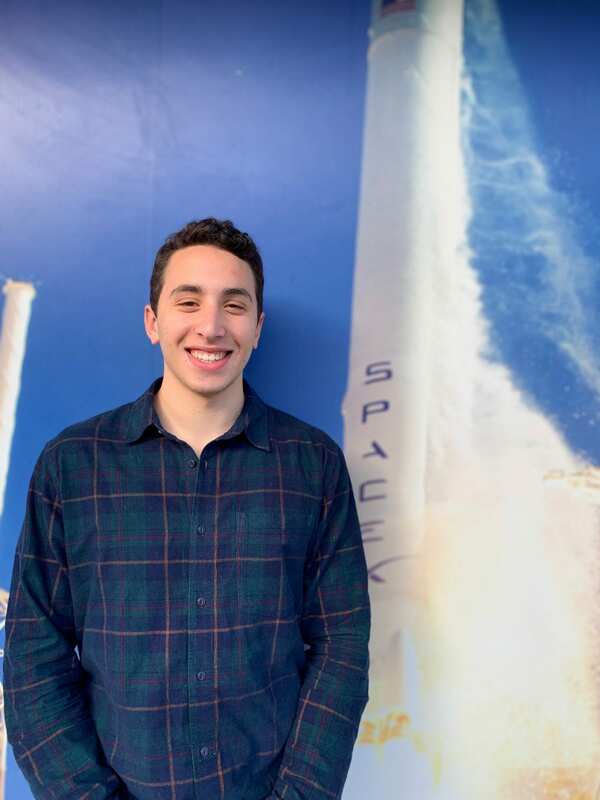 The startup was founded by Drake Weissman, Weinberg ’20, who is a Fellow of The Garage’s Little Joe Ventures program, which empowers undergraduate entrepreneurs through unique experiences and extensive coaching. City Health Tech, which focuses on reducing illness by promoting extended handwashing, placed third and received a $250 cash prize and $1,000 in University funding. The startup, which has created a prototype device that affixes to bathroom faucets, is the most recent in a series of companies incubated at The Garage by Ibraheem Alinur, McCormick ’20. First place winner NPowerU is an initiative to improve safety by, among other things, arming students with personal security alarms. McCormick sophomore Lilliana de Souza began brainstorming ways to make students safer after several students were victims of crimes in late 2018. A transfer student from Miami, de Souza has been a regular visitor to The Garage since arriving in Evanston. 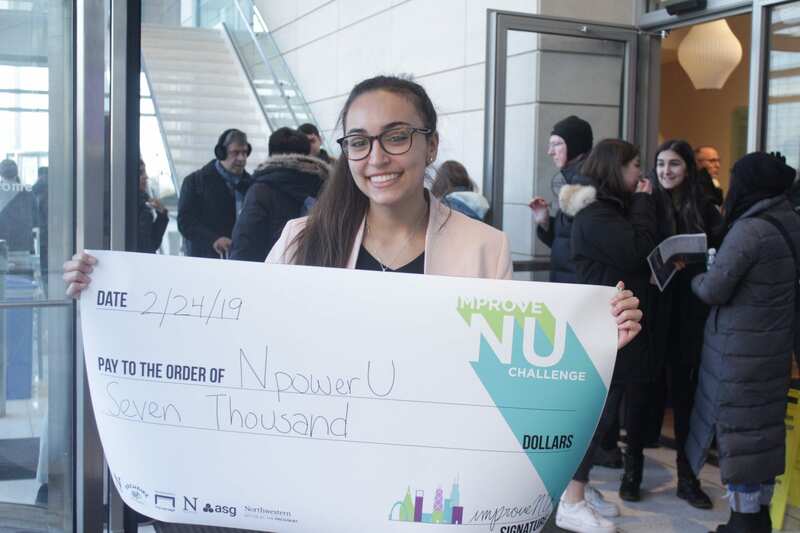 She will become a Resident of the program in the Spring, able to tap into a network of professional mentors and other resources as she uses the $750 cash prize and $7,000 in University funding she was awarded to help make NPowerU a reality. 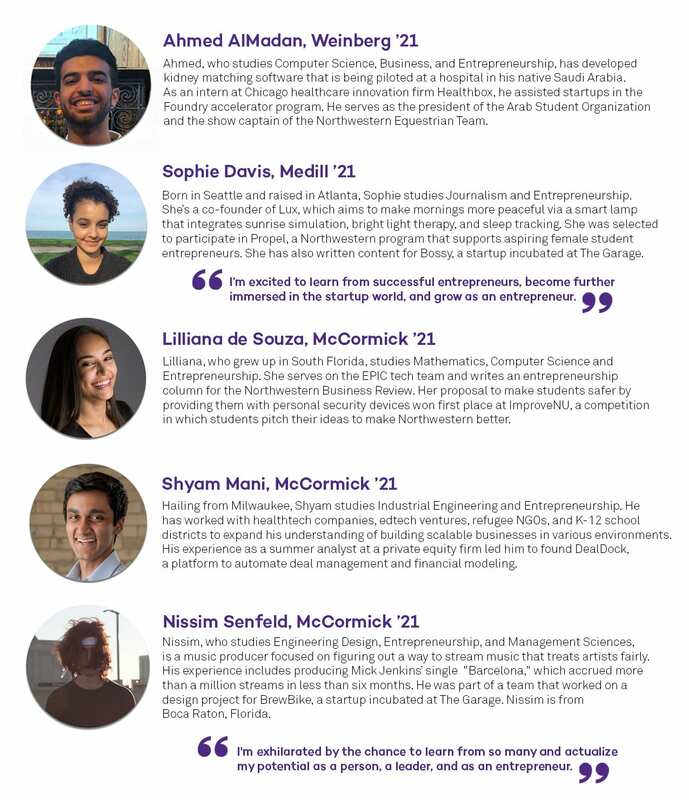 Judges praised the other five finalists for their thoughtful pitches, all of which have the potential to improve Northwestern. The Melodi House and CatsWork, both current Resident teams, were encouraged to continue to pursue their efforts to improve, respectively, social opportunities and job recruiting guidance for students. The CatsWork Team including team lead, Nicholas Tan, McCormick ’21. Also receiving a nod from the judges was Tyler Ennis, SoC ’20, who, as a Tinkerer at The Garage, has been working on an idea to provide local businesses with reusable food containers to replace disposable containers that are delivered to campus. 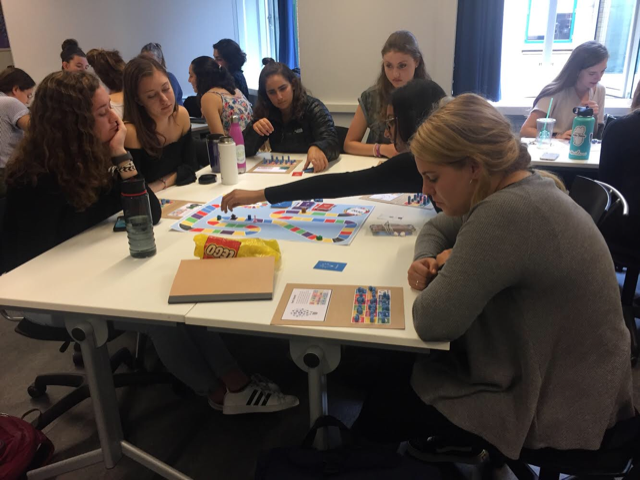 In the fall of 2018, Ronni Hayden and Rebecca Fudge rolled the dice and started at The Garage to develop their board game, which aims to teach high school students about the 17 United Nations’ Sustainable Development Goals. The Garage sat down with Ronni to learn how her SustainED work meets play. What are your goals for SustainED? Not a lot of US schools talk about climate change or the United Nations goals. We’re trying to find a way to incorporate the board game into the Next Generation Science Standards so we can get it into classrooms and get teens talking about the goals, thinking about the ways they can work in their community and be empowered to know that change is possible. Making big change by 2030 isn’t as impossible as it sounds. Each player is a made-up country, and they’re acting as the UN delegate. They’re trying to gain progress toward each of the 17 goals. You roll a dice and you move around the board, and different tiles code to different colored cards that you draw. There’s solution cards, which will teach you about a real solution that’s been implemented toward that goal. You can trade with other countries, which really emphasizes the importance of collaboration in the real world. There’s disaster cards, which show how island nations or nations that are impoverished are more affected by climate change. There are cards where you can come up with your own rule that you want your country to implement, which helps students think critically about what each of the goals mean. 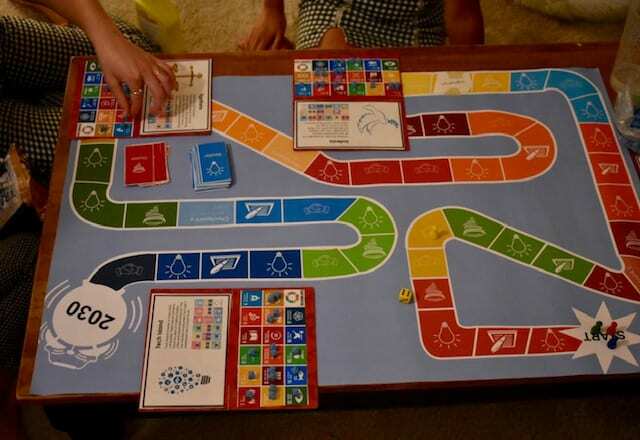 As you go around the board, you’re gaining progress towards the goals, learning about collaboration and disasters and working toward passing different checkpoints by the time you reach 2030, which is the end of the board. What’s been the reaction from students who play the game? This summer, we tested it with Northwestern undergrads on campus, as well as grad students. Of course we want [the game] to be educational, but we also want it to be fun. We were really excited to see how into the game people got. [When we play] with younger teens, initially they’re nervous, but as they progress and learn more, they become more empowered to come up with their own solutions. We’ve been really happy with how competitive people get in the game, and also how much it seems that they enjoy learning. These are really topical issues. We’re running out of time. Whether or not you’re interested in studying science or going into these fields, [climate change] is still going to affect us. It already has. We’re hopeful this [game] is one way for people to learn about these [UN] goals. The Garage has been really helpful. Our mentor, Mark Desky, really keeps us accountable and working towards the things that we want to do every week. We wouldn’t have found him without The Garage. Having so many students around working on entrepreneurship has been really great. It can be really overwhelming, but when you look around and see all of these other students who are also choosing to allot their time this way, it’s really inspiring. Approximately 1 in 59 children have autism spectrum disorder, according to the Center for Disease Control and Prevention’s Autism and Developmental Disabilities Monitoring Network. Children on the autism spectrum may suffer from meltdowns. But Products for Autism Lifestyle (PAL), a subsidiary for Gaia Wearables, is creating smart clothes that monitor biometrics and transmit data to an app that alerts caregivers of early signs of meltdowns. The Garage sat down with PAL co-founder Brent Chase to learn how PAL aims to change lives, one shirt at a time. It’s pretty well documented that you can identify different states of [physiological] being. The most movie-esque version of this is the lie detection tests. There’s other ones that look more toward how you quantify people with depression or people with other nonverbal disorders, such as autism spectrum disorder. The idea behind [PAL] is a smart shirt that measures all of these physiological data. It’s all connected to this core unit that’s on the shirt that can be detachable. Wash the shirt, you’re good to go. It gathers the data [and] sends it to a mobile app. So if you’re a parent, caregiver, therapist [or] teacher, [you] can see what the [child’s] emotional state is, and then help them develop to this more independent state. [My brother] grew up for the past 22 years having autism spectrum disorder. It’s very hard for him. It was hard on the family. So the real inspiration behind [PAL] was I saw how hard it was for my brother just to live day-to-day. He would wake up and potentially have a meltdown, which is harmful for him…harmful for everyone. It limits his ability to continuously develop into this more independent state. Right now he’s 22 and lives with our mother. He can’t necessarily pick up a job because of these meltdowns. Me and my mother can [understand his states]. We have been living with him for years now, and we know the little triggers and what to do to either proactively avoid or stop them when they occur. If he can go to an employer and the employer has access to something that would let them know when he’s at risk of a meltdown, then they can better manage him or help him better control everything. This was a common thing we were seeing. Everyone kept saying they wanted their child to be more independent. If you can give the people the technology, then they can end up developing it into what they need for that independence. The name carries a lot of weight for us to get connected, not only within the institution, but also [within] the general community. [The Garage] also helps us with getting more people on the team. The beauty of what we have is none of this would be possible without the commitment of all the team members. I feel like a big thing in entrepreneurship is this rush to get something out there and start making money, but in reality, if we all just keep focusing on the money, then no one is going to create any real innovation or change any lives. So [PAL] spent more time in this incubation period focusing more on how can this solution actually benefit the people. PAL’s product will be released in January 2020. Interested in getting involved? PAL is looking for people to join their human study. Participants wear a wristwatch that monitors biometrics for 20 minutes, and then they have the chance to win 50 dollars. Here is the link to add yourself to the future studies list. Here is the link to add your availability for user testing at Northwestern University’s Evanston campus.